Mt. 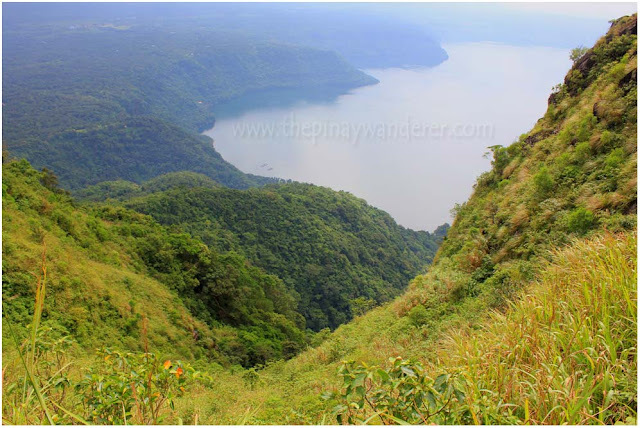 Maculot is one of the famous day-hike destinations near Metro Manila. 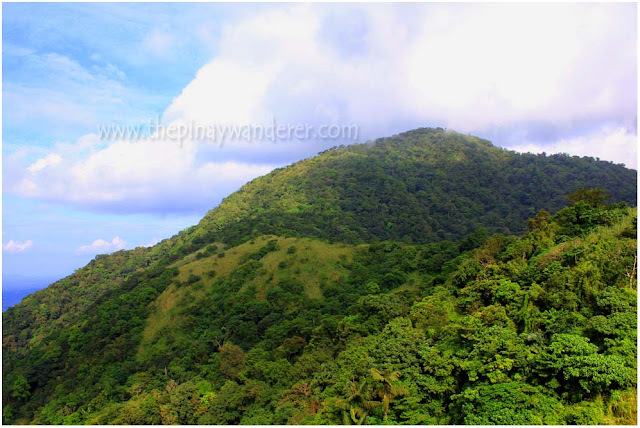 It is located in Cuenca, Batangas and stands at the height of 930 MASL (meters above sea level) on the summit, 706 MASL on the rockies. 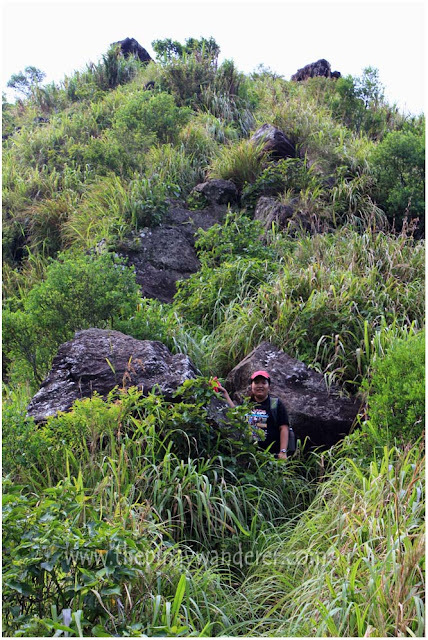 It is considered a minor climb with difficulty level of 3/9 and trail classification of 1-3 (source: www.pinoymountaineer.com). We planned our climb to Mt. Maculot end of September and scheduled it on the first weekend of October. A day before our climb, PAGASA issued a rain and thunderstorm warning in the vicinity of Batangas so I thought the plan would not push through, plus it's actually raining in Manila that time. However, a friend/mountaineer inquired from some of her friends if it's safe to climb Maculot when its raining and they said it's fairly safe, so off we go to Batangas the next day. We were supposed to meet at Jollibee Buendia Station at around 5:30 - 6:00AM but one of my friends texted me at around 4:30AM telling me that they were still preparing their pack lunch (they'll be coming from San Mateo, Rizal) so I didn't rush out. I reached Buendia at around 6:30AM, super late but I still made it ahead of the couple who texted me...hehe! From Buendia, we boarded the JAM Transit, left Buendia at around 7:00AM and reach Cuenca around 9:00AM. It could be earlier had the bus took the Star Tollway but unfortunately, it passed through the major thoroughfares of Batangas hence, the longer travel time. Anyway, we estimated our ascend to start at around 9:30AM so at least, we're still on schedule. And luckily, the weather was fine that day, it never rained though the sky's still gloomy. Thank God! Anyway, it took us more than 2 hours to reach the campsite. And there were a number of campers there already, good thing we were just on a day-hike. 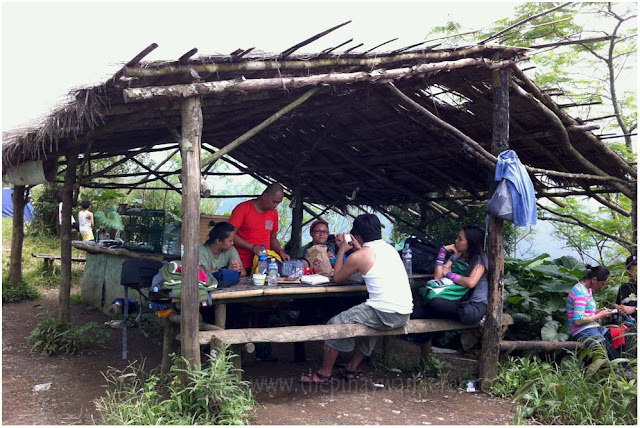 We stayed here for a while, had our lunch in the kubo, rested more for around 30 minutes and then continued our way to the Rockies. I thought I would never make it to the Rockies. A friend apprised me beforehand that there is this bridge-like section less than a meter wide that we have to cross to go to the Rockies. Thankfully, the grass there is taller than me I didn't notice the cliff while crossing. But when I reached the other side and started my climb to the Rockies, I almost backed out. The rocks, or should I say the boulders are too big, I had difficulty climbing it. Thank God my friends never gave up on me, they threatened to leave me here encouraged me to continue and helped me all the way. See the boulders in the photo above? I had difficulty climbing those, they are so big my "long" legs couldn't make it over the boulder and climb it. So to get through it, I used my knees, almost crawling over it actually; thus, I got bruises on my knees. Anyway, I'm glad I was able to make it to the Rockies. The view from there is so breathtaking! 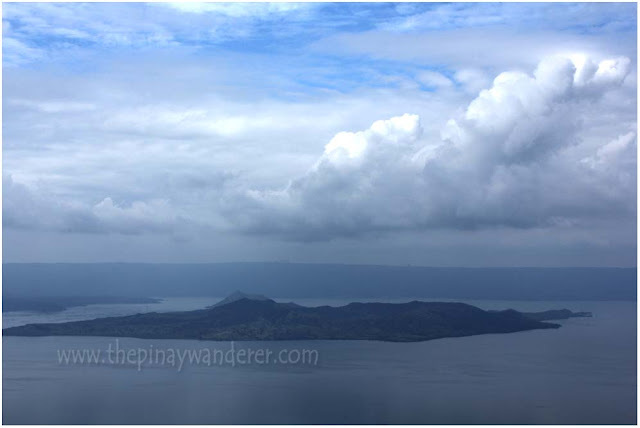 I had a panoramic view of the Taal Lake and the Taal Volcano as well as the province of Batangas on the far end. I wasn't able to take a lot of photos as am afraid of going near the cliffs, so these are just some of my photos. 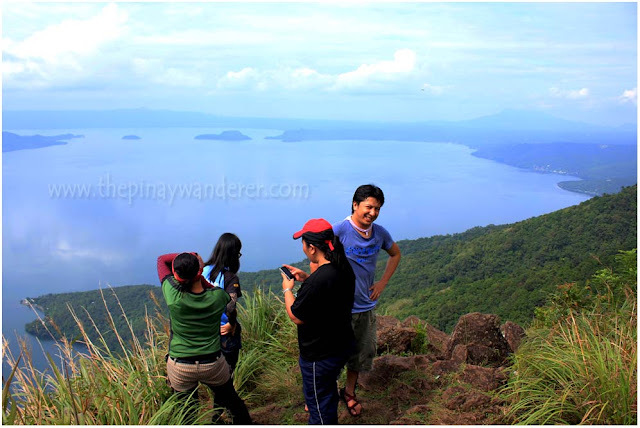 With us on the Rockies, Taal Lake on the background! We stayed here at the Rockies for over an hour. My friends enjoyed taking their photos on the cliff, daredevils they are! Poor me, I don't have a photo just like them. But I know my limitations, so I'm not envious really. I'm just glad I was able to conquer and survive Mt. Maculot Rockies! After more photo-ops, we started our descend and reached the foot of the mountain at around 4:00PM. Had some halo-halo from the vendor there, did some chit-chat with them too. And I asked them why the mountain is called Maculot but they weren't able to give me a straight answer, just that the mountaineers were the ones who called it Maculot. He also said that this mountain was used to be called Macatmon by the locals. galing naman nyo. 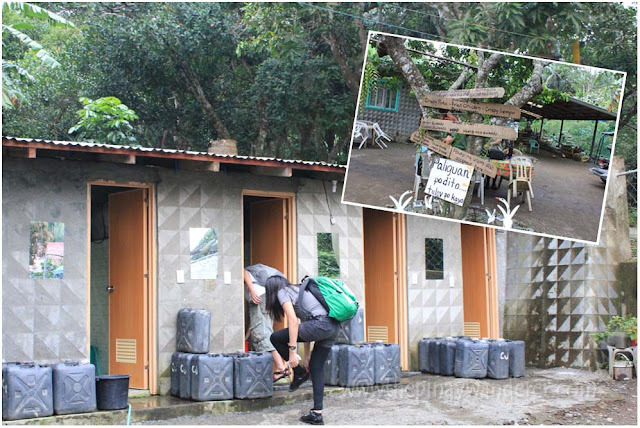 Before I think na dabgerous mag montain hike dahil sa mga NPA, pero di pala. Ganda dyan:)I enjoyed the veiw. By the way do mind sending me your home address to my email ccount: syrin@tele2.no? Thanks ms Joy, email po kita later. Safe na po umakyat ng mga bundok ngayon, dami na kase umaakyat. Congratulations! Magdadalawang isip din siguro akong ituloy kung ganyang kalalaking bato ang aakyatin ko haha. 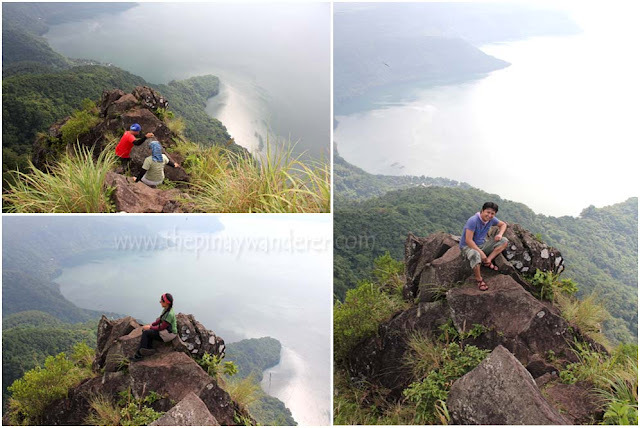 Nakakamiss pag hiking last hiking ko 2009 pa ata---ibang klase kapag narating mo na ang tuktok! Ang kulet lang ng 7/11.. Seriously, para saken ang galing mo na kasi na-survive mo ang climb na yan.. wala pa kasi ako na-climb ni isang bundok e, nuknukan ko nga kasi ng tamad maglakad e, sa climb pa kaya ako sipagin, haha.. saka takot ako kasi baka may snakes sa trail.. Nag-crave tuloy ako bigla sa halo-halo, hehe! Buti may shower area..
yan talaga ang tawag nila sa store girl, 7/11 kase nga daw lahat mabibili mo at wag ka, singmahal din sya ng 7/11, baka mas mahal pa pero sabi nga nila, dahil di ka na mahihirapan magbitbit pa ng pagkain/inumin para sa hiking, sulit na kahit gano kamahal. hehe..
akyat ka na rin, ala naman mga ahas sa established trail eh, ala pa naman ako nabalitaan na naka-encounter ng ahas sa trail. 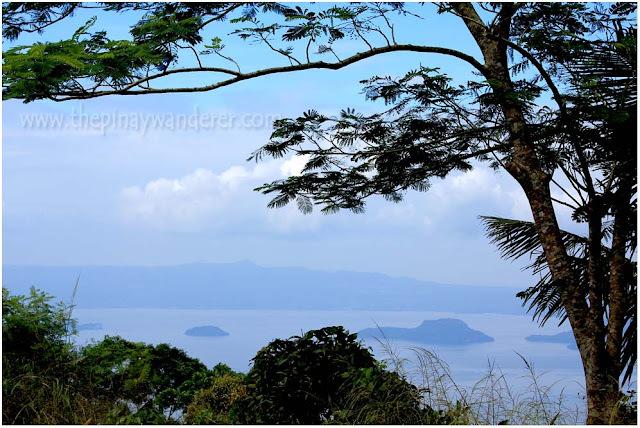 mag-taal volcano ka na lang, madali lang sya at malinis daan, pede ka pa mag-horseback riding para di ka mapagod, bayad ka nga lang..hehe! Breathtaking scenery! Ganyan pala ang tanawin dyan sa Taal Lake, ganda grabe. Buti ka pa nakakaakyat ng mga mountains dyan, ako kaya kaya ko pa ba? Ilang mountains na naakyat mo? May dream akong puntahan dito sa Norge sana by summer at sana makaya ko hehe, bigyan moko tips! oo, dami nga umakyat nung weekend na umakyat kami eh, yun iba pami-pamilya pa.
wow! tapang nio sis!..taga-Cuenca ako pero hindi ko pa naakyat ang rockies..gang groto lang ako hehe..may nagaya na saken dati pero hindi ko talaga kaya iniisip ko pa lang nalulula na ko grabe lang..pero mukang worthit naman dahil sobrang ganda ng view based on the pictures..
naalala ko lang may narinig akong nagsabi na kaya daw maculot kasi mukang kulot kulot daw yung bundok dahil sa mga puno hahaha..ikaw na bahala kung maniniwala ka..
Pero galing mo rin ha, naakyat mo mga boulders na mas malaki pa sayo! Congrats!! Gusto kong ma try yan, nung bata pa ako maraming bundok kung saan ako lumaki yakang yaka ng mga legs ko hehehe. Ewan ko nlng ngayon since city girl na ako wala ng praktis hehehe. Grabe breath taking ang view. hanep ang view... sana ma experience ko din ito... mukhang nakaka enjoy ito..
ay! grabeh! diko kakayanin yung boulders na yun. pano mo nagawang yung descend? yun ata mas nakakatakot. talaga bah? pero nakakatakot naman bumagsak. Naku parang ang hirap nga akyatin sa laki ng boulders! Hihingalin ako dyan. heheeh! Pero wagi ang view! Ganda! LOL I believed "threatened to leave me here" more than "encouraged" is the one that motivates you to continue the the climb ha ha. Amazing photos! Congrats on another successful climb. Err... hindi ka naman aakyat ng bundok sa Christmas neh? kailan ka umakyat sa Maculot? Ang ganda talaga sa rockies! Looking forward to hike with you and the rest of the bloggers. Kudos for making it on top.